The quilt should be for a toddler bed, but WILL IT BE NOT TO DARK??? I mean that brown color? I've just made a few blocks and put them together to see how it will look like, but not sure about the brown.. What other solid color could fit my quilt (I don't want white)? With greens, yellow and dark pink..? Or maybe is it not that bad as I think...? Just don't know what to do.. Keep going or choose another solid? Last edited by Jurgita; 05-13-2013 at 10:12 PM. Here there's a big difference between boy (blue, never pink; automation, never flowers) and girl (pink, flowers). What's it like there? What fabrics are available to you? The pattern you've chosen is great and looks like you're doing a great job. What is the child's favorite things to play with? Often this can be a start for fabric choices. Here toddler quilts can be anything from pretty lights (pastels) to happy brights to high contrast strong. I'm not a fan of brown, but it can be OK. With the prints, I might like medium-dark torquoise/teal/blue-green (this is a language thing-not sure what the color would be called there). In Lithuania I haven't seen such beautiful fabric, that's why I've ordered it online.. Had to order something brigther though. How about add a dark solid turquoise (to match the large flower in your flower fabric). Make turquoise hour-glass blocks (with the other prints- yellow, green, pink, and floral) and an equal number of brown hour-glass blocks. Then when you construct the top, alternate between the turquoise and the brown. It will lighten up and spread out the dark brown. (Which is still pretty). I think that is a very pretty start to a nice quilt. I am not a color expert so leave that to others. I love whay u have made think it is very pretty and cheerful! IMO....The dark brown kind of reminds me of a teenager aged quilt...more modern. For a girl toddler I might go with a medium shade of red, pink, or even sky blue (good luck finding turquoise! been looking for it myself). If you go shopping for the fabric, take some of other fabric with you and lay it on top of it and step back to see how it looks. That's a great block to work with for a first quilt. 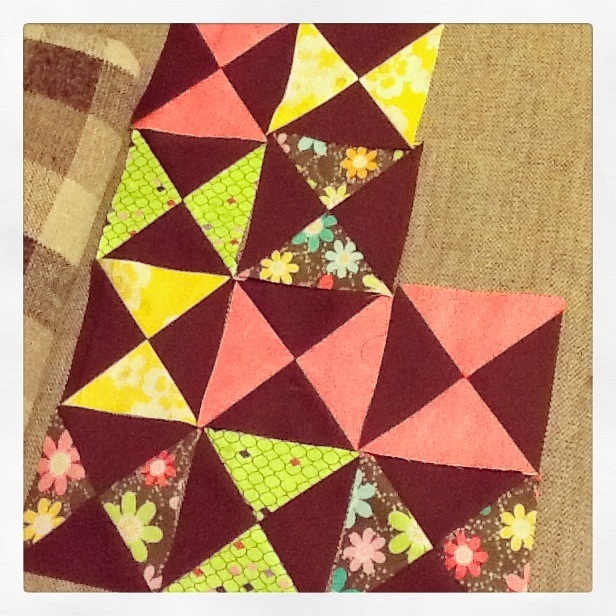 Make sure to square the all the blocks to same size before you start sewing them together. Hope you don't mind the suggestions, but you said it was your 'first ever quilt'. Nan (who just finished a light brown, sage green and creamy yellow quilt with jungle animals on it for a baby...cause that's the colors the mom will use in his room....hahahaha!). How about adding a lime green or yellow to lighten it up? Since this is your first quilt, I don't think I would get too hung up on the colors. What you have so far is lovely and the fabric choices coordinate well. It might not be something that you would pick for a toddler, but toddlers do grow! I would finish the quilt just as you have it and count it as learning the quilting experience. When it is done, you can give it to someone as a gift, keep it until your little one is a bit older or just give it to her now. 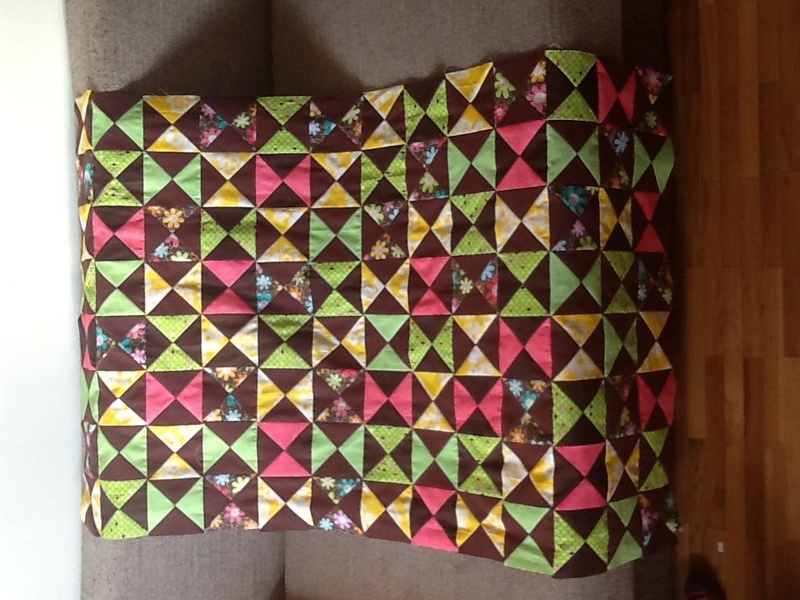 A darker quilt for a toddler won't show as much dirt after it's been dragged around! I think the other colors liven up the brown. I think it is very nice. Why don't you lay the blocks down and let your daughter loose in the room and see if she is drawn to it. Unless it is going on a bed and you aren't comfortable with the colors in her room - but she is 3 so she won't analyze and will love it! My mom is making a pink and brown (it does have more pink than brown) quilt for the little neighbor girl (probably about 2-1/2) and took it over the other day (unquilted) to see if it passed the mother test. That eneded up not mattering because Marilyn toddled over and went OH so guess it passed. Thank you aaaaalll for your kind answers! There will be 104 blocks, I'll just put some more yellow, and it should be okay, I guess..
Just haven't decided about the quilt style, wanted free motion, but still haven got my darning foot for my Bernina. What can I do with a WALKING foot, that I have got? Any ideas? The contrast between the dark solid and the lighter prints makes the quilt lively and cheerful. I wanted free motion, but still haven got my darning foot for my Bernina. What can I do with a WALKING foot, that I have got? Any ideas? Jurgita, there is a lot of quilting you can do with your walking foot using straight lines. Here are a few ideas that may excite your imagination for others. And, yes, gentle curves can be done by slowly moving your fabric layers as the needle stitches. By the way, your English is beautiful and puts most Americans to shame as there are not many of us who can speak second and third languages!! I've quilted several baby quilts with straight diagonal lines with my walking foot. Start with a big X from corner to corner, then work outward, using the guide attached to the walking foot to set the distance to the last line over. I did my lines about 3" apart. Last edited by Skyangel; 05-14-2013 at 09:17 AM. i have a 5 year old girl and inasked her to help pick the colors and fabric. cant go wrong there. i would di tch the brown, wrong shade to me and go with either a blueish green color or maybe a nice green. have your dd help you. it will be good for you both. Hello Jurgita, My grandfather was from Lithuania...name of Gorgeleit. Know very little about your country. Would like to know more. Your quilt should please any child. Good luck with your work. My 25 yr old married granddaughter finished her first quilt this year and gave it to me. I love it because she made it and think of her when I use it. Keep reading QB and writing on it. Your English will become more natural. You're already doing way more than I'd ever hope to do with your language. Have had lots of opportunity to learn Spanish-I'm hopeless with language. I think you are off to a good start with your quilt. So glad to have you here on the board. You will learn a lot if you ask questions. Everyone is eager to help and very generous. Looking forward to seeing more of your work on here. I think your quilt is great! The colors go well together, and dirt won't show up when it is "dragged all over the house." Your daughter will be delighted with it. It does not matter really what others think of your quilt. But it does matter that you don't like it. If you do not think you will want to work on it due to to the colour, change it. You could incorporate a dark blue or a soft blue or turquoise, for instance. Whatever makes you want to look forward to sewing and then giving it is the ticket. Get some scraps or some clothes of different colours you think will go with it, and then decide what looks best. Then choose that shade to work with the other ones. Nice work so far! I like it and I think it will be fine. Just a thought...check out the Fat Quarter Shop. http://www.fatquartershop.com/ They have some great bright colors for girls and for boys too and do international shipping. I think you have very good contrast between the yellow, pink, flower print and brown. They are showing more Brown's in young children's items girls and boys. At least here in the States. The turquoise is a good idea too, if that appeals to you and you are able to get what you want. Alternating between the brown and turquoise would make it brighter. You are doing very well on your first quilt! 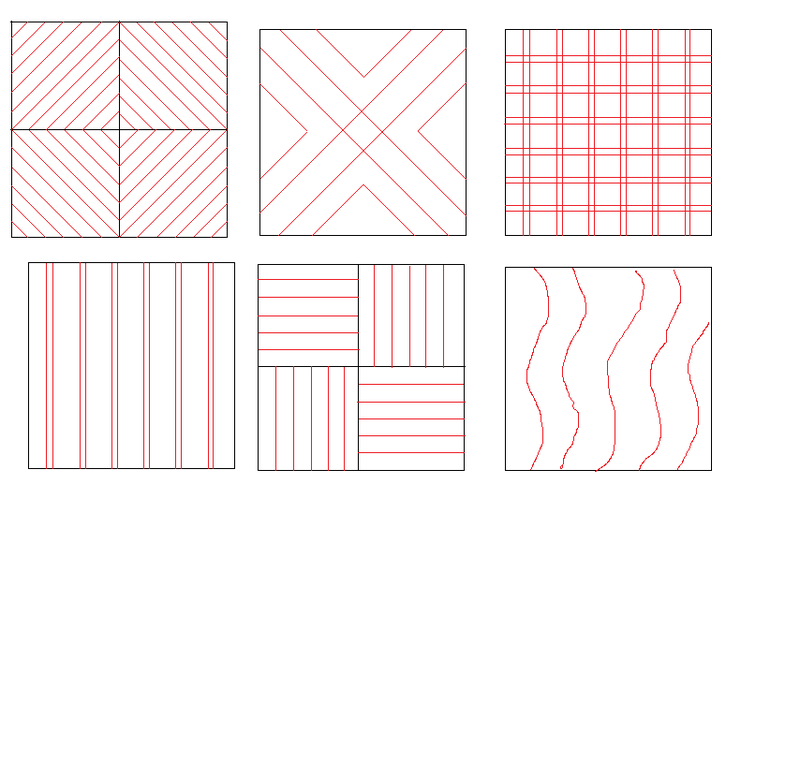 What do you think on quilting method? Today I will receive my darning foot, so I will be able to make a free motion quilting. Or FMQ would be not that great idea? Or should I choose walking foot and do straight lines? Maybe stitch in the ditch?